I'm back with another simple dinner recipe! This one is perfect to cook while you're away at work, or when you're having guests over and don't want to spend all of your time in the kitchen. Just prep a few ingredients, and the slow cooker does all of the work for you! I decided to make my first cooking video as well, and let you in on my favorite way to cook... I come up with an idea of something to make, get a basic recipe layout in mind, and start cooking! It's so much fun to tweak things as I go & get my creativity going. I came up with this recipe after picking up a pork tenderloin for a really good price at Trader Joe's. 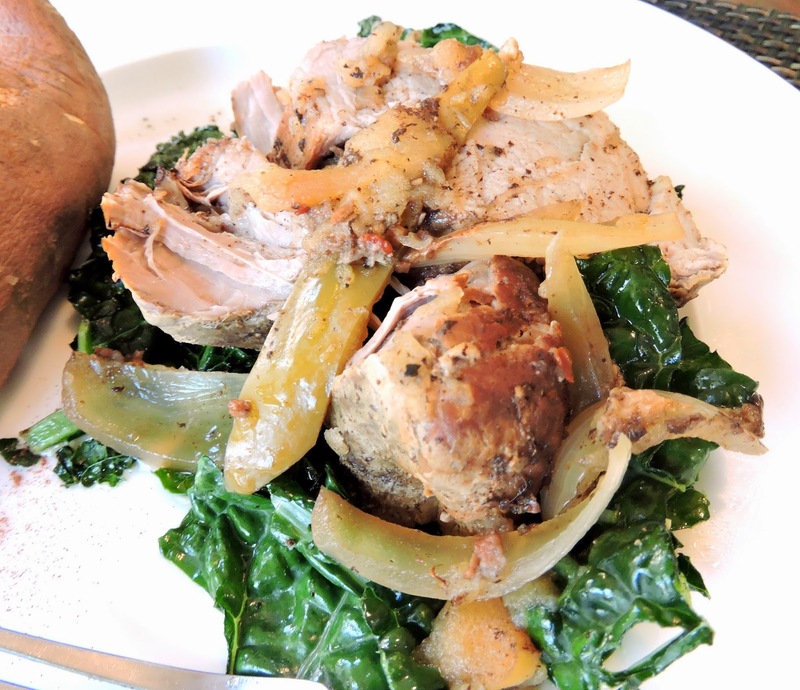 The flavors of the pork go so well with the sweet, light flavor of the white onion, and the crisp flavor of the green apples. When the apples cook, they turn super soft & moist, and are perfect on top of a bite of pork. I love how the nutmeg compliments the sweetness, and the balsamic vinegar makes it a little tangy. The juices are delicious served over top as a sauce! The ingredients in this dish are simple, yet very flavorful. It's also super easy to make, and I had lots of fun recording my how-to video for you guys! Please feel free to leave me any feedback on how I filmed it... It's all really new to me, so I would love your comments/advice :) Let me know if you liked this, and what else you would like to see! Core the apple and evenly slice it. Slice the onion into a similar shape. 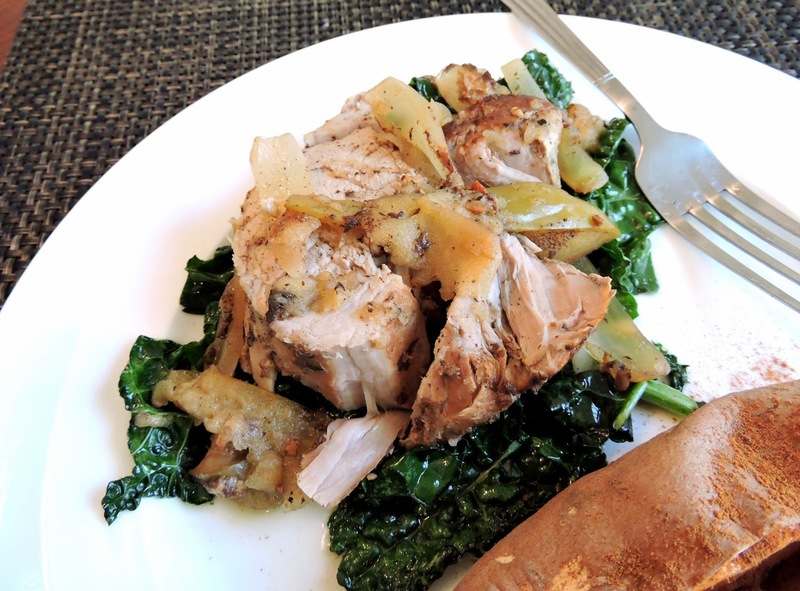 Lay the apples and onion into the bottom of your slow cooker, and top with the pork tenderloin. Make sure the pork is touching the bottom of the dish so it will brown on the bottom. Sprinkle with salt, pepper, and nutmeg, and top with sauce. Cook on the low setting for 5 to 6 hours. Remove the meat, slice, and serve with apple, onion, and sauce over top. I recommend serving it over sautéed veggies like green beans or kale! Love your videos! I showed the first one to Lisa the other day and she loved it, too. Keep 'em coming! Thanks grandma!!! After we were talking about the whole video thing at your birthday, I kept thinking about it & decided to give it a shot! I am very blessed to have a girlfriend who is extremely creative, intelligent, and caring. This recipe is awesome. I'm doing this for my family, tonight. I caught it on stalkerville.net! Awesome Mark, thanks for taking the time to let me know. I would love to hear how it turns out!